Edmund Bevers (1811–1880) was born at St James’s, Westminster, and started his career in London. He spelt his surname as “Beavers” until 1841. 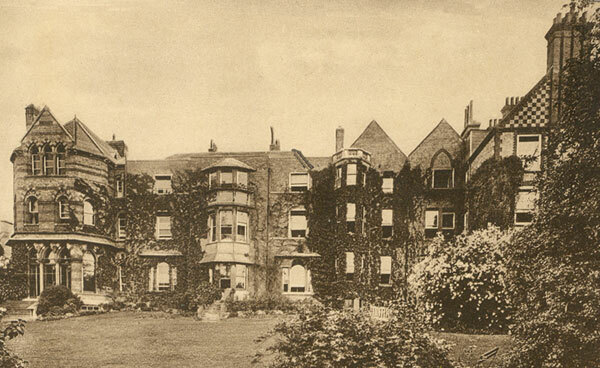 During the period that Bevers was based in Lower Cowley House, the main house was owned first by an upholsterer called Cooke, and then from 1843 by the surgeon William Tuckwell and his family. In consequence of the unfounded reports, Mr Beavers takes this opportunity of informing his friends there is no connection whatsoever existing between him and Mr Lukyn, who formerly resided at Cowley House. 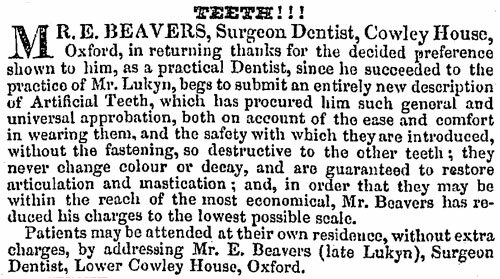 During 1841, as well as changing the spelling of his name, Bevers started to insert a simple line advertisement in the newspaper reading, “Mr E. Bevers, Surgeon-Dentist, Lower Cowley House, close to Magdalen Bridge, Oxford, at home from Ten till Four”. 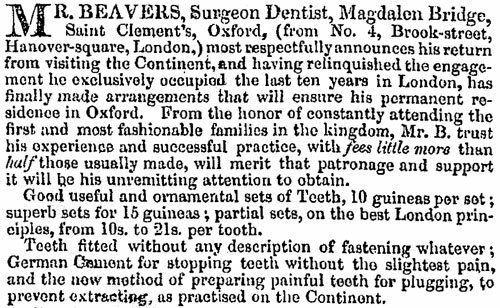 In 1844 he gave the following additional information: “All the various descriptions of original natural, mineral, and the patent Vitrious Teeth, from one to a complete set”. Bevers married Isabella Coggan at Islington in 1842, and their first two children Winifred and Augustine were born in Oxford in 1846 and 1847 respectively. On 1 September 1849 Bevers inserted a “Notice of removal” in the newspaper, announcing that he had moved from Lower Cowley House to 46 Broad Street. His son Harcourt Arthur Bevers was born in Broad Street early in 1851, but his first wife Isabella died soon after the birth. In the 1851 census Bevers is described as a widower of 39, living with Winifred (3), Augustine (2), and Harcourt (6 weeks). Bevers then (illegally and discreetly in London) married his deceased wife's sister Alice Coggan, and they had three more daughters: Margaret Isabella (1855), Catherine Alice (1857), and Dora Emily (1859). At the time of the 1861 census there was an assistant dentist, Augustus Cornwall (46), living in the house: he was also born at St James’s Westminster, and may be a relation of Bevers. At the time of the 1871 census the only children living at home with Bevers and his wife were Winifred (22) and Catherine (13). At the time of the 1881 census the head of the household at 46 Broad Street is Bevers’s widow, Alice (58). As well as her own three grown-up daughters – Margaret (25), Catherine (23), and Dora (21) – two of the grown-up children by Edmund’s first marriage – Winifred (33) and Harcourt (30) – are living in the house, plus Mrs Bevers’ widowed older sister Eliza Newman (73). The family has two servants. Edmund Augustine Bevers is described in the census as “Dental Surgeon LDS RCSE”, and in directories from 1881 to 1889, “Messrs Bevers, Dental surgeons, and E. A. Bevers, Surgeon” are listed in directories at 46 Broad Street. He became Mayor of Oxford in 1903 and again in 1908. His only son Edmund Cecil Bevers (1876–1962) was elected consulting surgeon at the Radcliffe Infirmary in 1915. From 1889 to 1892 another of Bevers’s sons, Harcourt Arthur Bevers, LDS ECS, is listed together with Edmund as Surgeon dentists at 48 Broad Street . Then from 1893–1921 Edmund Augustine Bevers, MRS is listed without his brother as Physician and Surgeon-dentist (with James Benjamin Edgar from 1904).